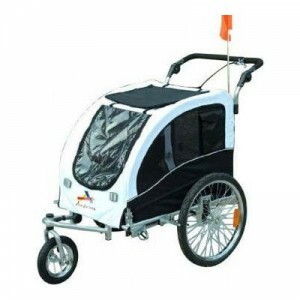 If you are looking for a way to bring your dog on a ride-a-long with you, bicycle trailer is the right thing for you. With this product your pet will never have to stay at home alone. I present to you list of 10 best dog bicycle trailers. Enjoy! This model is the very best of dog trailers world and you will be more than satisfied. It has removable floor, so you can wash it the minute it gets dirty, and optional tie downs for security. There are also side battens for stability and flip down tailgate for loading and unloading. As for the warranty goes, you will get comprehensive limited warranty of one year that covers fabric parts and three year warranty for plastic parts. You will be presently surprised with all weather cover and waterproof zippers and also with heavy duty mesh cover on four sides for airflow. Rust proof aluminum frame allows you to use this trailer even in the rain. It is large sized and suitable for dogs up to 110 pounds. Front door have water resistant layer and mesh screen layer, and rear door have mesh screen and a spacious sunroof. Easy installation will give you no trouble and since you can fold it down, you can keep it in your garage or storage space. If you are concerned about pet’s safety then you should know that this trailer has adjustable safety leash. You can use this trailer in two ways, as a pull behind trailer or like a push stroller, the choice is yours. It has multiple mesh-vented windows for maximum airflow and visibility of your pet friend. It is very easy to install and assemble, so you won’t have to worry about that. Capacity of this trailer depends on if you use it as a pull behind or push stroller. If you use it as a pet trailer capacity is 130lb. and for pet stroller 85lb. This model is pretty light weight and made of sturdy steel with water resistant polyester. It can support weight up to 66 lbs and with safety flag you will be always visible in the traffic. It can be fold up so you can easily transport it wherever you like, it can fit in most of the vehicles. You can even lock it with hand lock brake system if you are not in motion, for example, if you are resting or in a shop. It doesn’t matter what height are you, you can use this trailer and take your dog for a jog, and adjust the handles to the height you desire. The front wheel of this trailer can be fixed for jogging and swivel for strolling. Maximum weight limit is up to 88 lbs and you will need no tools to set it up or break it down, so that is very positive side of this trailer. It also has flag of 6.5 feet and bottom hole for the flag to slide in. You can magically fold down this trailer with just the release of one pin, and transport it anywhere you like. It has wheel holder so you can use it like a stroller and protective rain screen on the front panel. Your dog will love easy front access and you can bring water bottle and treats and storage them in the pocket on the trailer. It also has interior leash so you don’t have to worry about your dog jumping out. Doggyhut can be used even in the rain; since it has powder coated steel frame and water resistant polyester with anti slip leather floorboard. Your pooch can enter the trailer through rear zippered door and if you can fold it fast and storage in your garage when you don’t use it or transport it in your car. Maximum capacity that this trailer can hold is 25lbs. It can be easy assembled with no tools. 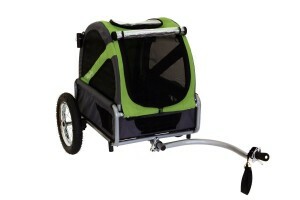 If you like to jog, but you don’t know how to bring your pooch with you, this is the trailer for you. This is one of the best trailers on this 10 best Dog bicycle trailers list when you compare its features and price. It is waterproof so you can use it on any weather and you can even remove front wheel and use it as a trailer. If you want to storage you can, and you can do it very simple with few steps. This trailer is easy to install and your pet will love it. This is very durable bike trailer and it will last you many years. It has simple design and it can be easy folded and store it anywhere you like. Coupler of this trailer can be attached to almost any kind of bike, so you won’t have to worry about that. It has capacity of up to 40 lbs and 16 in pneumatic tires. The last place on this list goes to Aosom Elite Jr, but that doesn’t meant this trailer is bad- quite the opposite. It is heavy duty, waterproof trailer with sturdy steel frame and quick release wheels. It has dual entry, from front and back and design so your pet can make an easy entry. You won’t need tools to assemble it and it will take little space for storing. This model can take the capacity of up to 44 lbs. Finding a good trailer can be really hard, if you are looking for a one with excellent price and good features that will last you a long time. So choose the one from this 10 best dog bicycle trailers and you will find a perfect match for your pet friend.